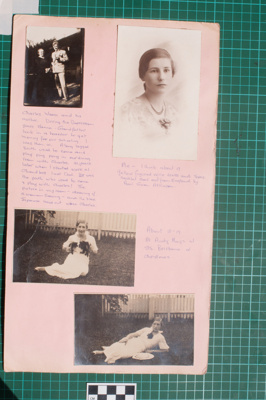 Four photographs mounted on a pale pink foolscap card with handwritten annotations in blue ink below. Described from top to bottom, left to right. Top Left: Portrait of a man and woman, identified as Charles Waern and his mother. A note reads: 'During the Depression years Nanna (Helen Emily Largent Mitchell b: 16/08/1887 d: 31 Oct 1967) and Grandfather (Kenneth Heath Laughton b: 1879 d: 29 Mar 1957) took in a boarder to get money for out schooling. I was then 10. A long legged youth used to come and play pingpong in our dining room with Charles. 14 years later when I started work at Chandlers I met Dad (Robert Johnstone Donaldson b: 10 Oct 1910 d: 1992). He was the youth who used to come and play with Charles! The picture in my room - drawing of a woman sewing - and the blue Japanese woodcut were Charles'; Top Right: A portrait of Gwenda (Gwenda Elizabeth Laughton b: 06 Nov 1915 d: 26 Aug 2010), said to be about 17. A note reads: Yellow figured violet dress and Topaz necklet sent out from England by Aunt Gwen Atkinson (Gwendolen Edith Muriel Laughton b: April 1890 d: 6.12.1957); Middle: Portrait of Gwenda with two cats at age 18 or 19. Taken at Aunty May's (Sarah May Bradley Mitchell b: Jan 1877 d: 16 Feb 1956) at Sth Brisbane at Christmas. Bottom: Portrait of Gwenda reclining on lawn from the same series as the previous image.